Both Chelsea and Arsenal have been linked with a managerial change this summer, but Michael Ballack has revealed his belief over what could tip the balance for Thomas Tuchel. As per Sky Sports, the German tactician has been linked with the posts at both the Emirates and Stamford Bridge, with doubts persisting over the long-term futures of both Arsene Wenger and Antonio Conte. It’s fair to say that both bosses have fallen short of expectations this season, while in Wenger’s case he has continued to face fierce criticism for some time now as Arsenal fans have grown frustrated over their inability to compete for major honours. In turn, it remains to be seen if a change is made at either club this summer, with Conte failing to follow up an impressive debut campaign at Chelsea which saw him win the Premier League title and reach the FA Cup final. Former Blues midfielder Ballack has been speaking on Tuchel’s future, and he believes that one key condition could swing the situation in favour of Chelsea if they are indeed in the market for a new coach ahead of next season. Chelsea currently sit five points adrift of fourth-placed Tottenham though, and so they have a real fight on their hands to ensure that they’re at Europe’s top table next season. Arsenal are further adrift and so that doesn’t particularly seem like a realistic objective for them, although they still have a path through the Europa League. 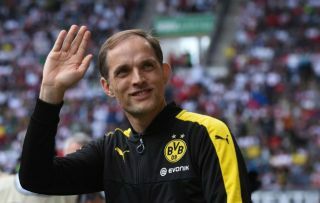 Tuchel enjoyed a positive stint in charge of Borussia Dortmund, establishing a 62.69% win rate with the Bundesliga giants having won 68 of his 108 games in charge. After being sacked in May 2017 though he’ll surely be itching to get back into management having made such a promising start to his career in Germany, and he could have an opportunity at the very highest level, but with that comes a potentially difficult decision on who to pick.